Sometimes we tie our worth to a child’s success or failure. We put blood, sweat, and tears into raising kids and we want a return on our investment. We measure our success in parenting by their success in life. … When they excel, it’s because we’re an excellent mom. … But when they fall short, we obviously didn’t do our job right. It’s a jumbo-sized tangle that puts a whole lot of pressure on our kids. And has the potential to beat us up in the process. I wanted to cup her face in my hands and tell her she was a wonderful mother whether her kids were on the honor roll or not. She tangled her performance a mom to the grades her kids made in school. And sometimes, that tangle can get nasty. When their kids are too tired, overwhelmed, or stressed, I’ve known moms to write papers or complete school projects. Other moms have argued with teachers over a bad grade. Some have turned a blind eye to plagiarism, giving their children permission to steal ideas and copy concepts for a good grade. And we’ve all seen moms who push their kids to the brink of a breakdown by heaping piles of unrealistic academic expectations on them. Because we think that if they fail, so do we. 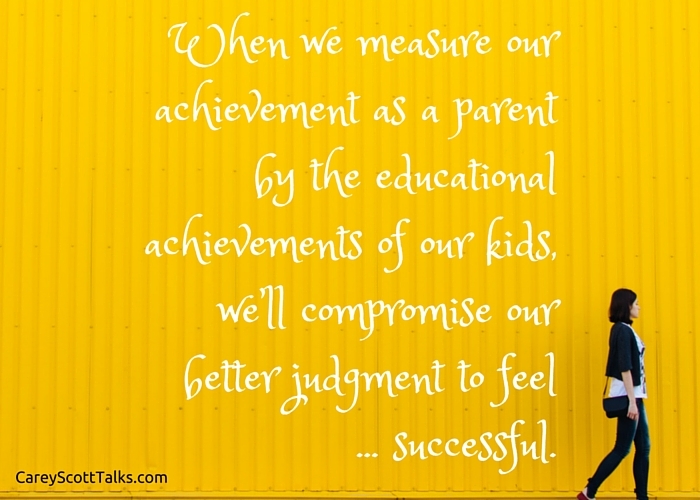 When we measure our achievement as a parent by the educational achievements of our kids, we’ll compromise our better judgment to feel successful. Let’s start preparing our hearts now for this next school year, and decide this isn’t a tangle we’ll get knotted up in again.